I was encouraged today to read of designer Annie Dow’s viewpoints (courtesy of Victor Billot standing for Dunedin North) about New Zealand political party logos, putting the Alliance and the Māori parties’ ones top of her list. As the creator of the former, I say a thank-you to my colleague. She believes the Alliance logo is ‘modern’. The Labour–National ones are either stuck in the 1970s or more suited to a bank, she says. I have to agree with her assessments. Labour is so ashamed of its logo that only a URL appears in the lower right-hand corner (telling me something already—an attempt to distance itself from its past), adopting the Font Bureau Gotham typeface (designed by my friend Tobias Frere-Jones) that Barack Obama uses; while National has divided its billboard budgets between two styles—a strategy that failed the party in 1999. The party, rather than candidate, ones resemble advertising for a telco or an ISP. Typographically, I am sure my friend Clive Bruton agrees that it’s very hard to beat Adrian Frutiger’s work—and I chose Frutiger for the Alliance. My friend Tim Kitchin (left) has an excellent video series, Window Cleaning, on his company’s website. Tim leads the ﬁrst video on social communication (a very ﬁtting introduction), while Johnnie Moore follows up with an interview about the beneﬁts of social media and their raison d’être and their limitations. Nicholas Ind, author of Living the Brand, has a video interview on what makes Patagonia the perfect role model for social communications. This does make it very Medinge Group-heavy, so Alan Knight does contribute a piece on the use of a wiki at AccountAbility. This is the best video series I have ever seen on these topics, especially from a brand point-of-view—surf there through this link. Some days, you get so caught up in life that you don’t get time for introspection. Other days, you discover or are reminded of something about yourself. Today’s situation was the latter. I joined the bus drivers today who were locked out of work here in Wellington. They decided to stage a peaceful protest, holding up signs criticizing Infratil management and stressing how they were expected to survive on NZ$12·55 an hour. A few representatives of the Socialist Workers’ Party were there, plus other unions were supporting them, which was encouraging. Now running for the Alliance, I wanted to see what their concerns were and asked a few of the people gathered there, and promised to pass their responses on to senior members of the party, which I did earlier tonight. It was the ﬁrst time I had speciﬁcally wandered in to a situation with my political hat on, rather than those of my various companies or of Medinge. Until today, my candidacy for Parliament had been something I had mentioned in passing. Interestingly, we were round the corner from the local Labour MP’s ofﬁce, but no one from the government or from the National Party came to visit the drivers. Maybe they considered their cause too minor. Or they had too many buddies at Infratil. Whatever the case, I wanted to hear more. As a businessman who is all too aware of the pressures management can face, it’s a humbling experience to see the other side and, in some ways, conﬁrm that government policy and the blind following of monetarist theory has made things tough for New Zealanders. As many people know, my political views are more Confucian, which can under some interpretations be at odds with democratic socialism in some respects. However, if we looked at the economy as a single company’s, things become easier to understand. Let’s assume for a moment that monetarism is a good thing (a rare hypothesis on this blog). If we imagined there to be a New Zealand, Inc., then what has happened since 1984 is a Carlos Ghosn type of management. A target was set and people were expected to extend themselves to meet them, or get trampled on. Some might not make it. Some, as has happened at Renault under Ghosn, have committed suicide. Few would disagree, certainly by the late 1980s, that the pace of change under Labour was far too swift. The opinions of most people by the end of the 1980s was that the more prudent route would have been to set milestones in place and gradually ease the economy into a new mode. This would be the Honda route: taking things step by step, beginning with lawnmowers, then motorcycles, then automobiles, then trucks. It takes decades, but no one gets killed. We need to wake people up and that is how I see my candidacy. That there is nothing to be gained by voting the opposition in just because one wants a ‘change’. National supported most of the unpopular Labour policies, not just in this most recent term, but fundamentally over the last quarter-century. A change is effected by looking at other parties, and I argue for at least some balance in the next Parliament. Hence my standing for Parliament. What I discovered today was not only a conﬁrmation of some of my views but how they really affected companies and their workers, beyond mere theories or ﬁrst-hand reports from friends in individual industries. Here was a group of people all in one industry, where management pressures have bitten them hard. As the child of blue-collar workers—a technician and a nurse—I have always had an afﬁnity for wage-earners. The guys at the printing plant, Format, which produces Lucire in New Zealand, know me regardless of whether they are management or print-room staff. They all know what it is like to struggle and work to keep others happy; the guys in pre-press and in printing, like me, remember what it was like running around to different suppliers in the old days to get typesetting, bromides, ﬁlm-making and plate-making done. I was blessed to have parents who sacriﬁced like crazy, just as hard as the drivers on the picket-line, to send me to a decent school and so I could go around wearing a suit and understanding all the prevailing management theories after a few uni degrees. Maybe I have found myself in this political position because I can see both sides—and that it’s going to take a real change in favour of New Zealand ownership and the building of national champions to help the situation I saw today. What will not work is more of the same, and by that I mean the technocratic viewpoints of Labour–National. I discovered, too, that I was never purely one of the drivers nor could I ever be one of the management. There was an old episode of Pointman, the mid-1990s TV series, where Jack Scalia’s Wall Street whizz-kid character returned home to help his working-class uncle and his colleagues ﬁght a corporate raider. There, too, he found he no longer belonged: the townsfolk could not see eye to eye with him because of his success and wealth, yet he found the idea of corporate raiding repulsive and wanted to defend the working men and women of the town. What I am is someone who can be an advocate for the working people of New Zealand, someone able to point out some of the faults in management or in government policy, and see if something can be done to nudge this country in the right direction. Confucianism took centuries to be fully realized but it has to start somewhere, and getting government to understand that it owes these people a duty is a useful ﬁrst step. A useful second step is becoming the government in order to fulﬁl that duty. 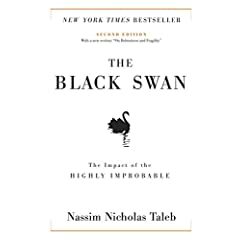 While it’s better to read Taleb for his meanings about Black Swan and Fat Tony, a reader can deduce the overall message. By relying on risk formulas, the American ﬁnancial establishment hasn’t heard the cry that the emperor has no clothes. And this year, that ‘slightest hiccup’ happened, collapsing numerous ﬁnancial institutions, including Fannie Mae and Freddie Mac. The Black Swan concept always made sense to me, even if I never gave it a name. Taleb has worked on Wall Street and exposed its fallacies; for me, it was being confused in my ﬁrst-year economics’ class (which I still passed, incidentally) because little being taught bore much resemblance to reality. (Dr Michael Cullen still believes it does, as does the Shadow Minister.) The guys who took money and ﬁnance (I took marketing and management) seemed to be from another world. Maybe their parents didn’t lose tens of thousands putting money into Chase Corp.
And now, as a layman, I see that those theories are no longer working. In fact, they are dragging a global economy down. We might blame, perhaps rightly, everything from the abandonment of Bretton Woods to an unsustainable culture of greed-fuelled growth. High share prices not backed by anything other than rhetoric. But we have heard all this before. On October 19, 1987, with the stock market crash, critics pointed at similar things. Taleb himself made a mint out of it because he could see it coming. But we didn’t heed the warnings that time and history seems to have repeated. I know there are differences but how substantial are they? Michael Lewis, in Condé Nast Portfolio—one of the few magazines I subscribe to—noted that the Black–Scholes model, which was exposed as having shortcomings on Black Monday, was ultimately never questioned. Taleb made a killing that day because he had, prior to that, become obsessed with the limitations of the model and how it could not predict extreme and rare events. I should adjust my criticisms of Black–Scholes above to CAPM and portfolio theory in general, because these do fall into much the same box, based on my formally untrained viewpoint. This does not have much directly to do with branding, other than the lesson that we at Medinge and others have been trying to preach for years: be authentic. Be real. If you have to bury the reason for your investment in jargon, then you’re not being authentic. This applies to traders and their actions in the sub-prime mortgage crisis. It is a business lesson, one that we failed to heed over the last 21 years. It also says to me that the various policies that the right-wing governments of Labour–National (let’s also be authentic here, for there’s no point separating the two since they have both pursued policies that drive a wedge between poor and rich in New Zealand) that exposed us to the sort of risk that should have been isolated to North America, have not worked. The alternative is not new regulation or fortress New Zealand. But we need to recognize that we have allowed foreigners to come in and control aspects of this nation’s economy and exposed us to greater risk. This has not been done with authenticity or transparency. I am ultimately for some Confucian ideal in economics, with self-regulation and global trading. Yet the opening up of the country’s markets in the 1980s have not seen much transparency at all. This is one area that Labour–National has not recognized, with the exception of certain primary sectors that have capitalized on globalization. Tapping in to ﬁnancial régimes around the world that have blurry, questionable models—as we have—can only end in tears. I realize I am talking nonsense if I expect the Wall Street establishment to change or become more transparent in the wake of the crisis. In such a case we should either be more judicious about investment or demand some form of transparency in dealings between nations. And as the ﬁnancial establishment has failed to do that, then maybe even in New Zealand it has no choice but to attract the hand of the state. I have too little faith that the traders who exposed us to the risk will admit to their fallacies, and that any real change will happen. There are too many foreign ﬁrms that will prevent that, and even Labour–National will not invite criticism of its policies that have weakened New Zealand-owned ﬁrms and the New Zealand worker over the last quarter-century. The only way change can be encouraged is if some of the same-old, same-old establishment players can be changed, ending the institutionalization of bad behaviours. I am not talking about taking one bunch of cronies and replacing them with another. I am, however, talking about putting in people who can see the wood for the trees, who can demand transparency and even anti-corruption policies, and end the fear that mortgagees and small- to medium-sized business owners have each time they hear news about interest rates or a ﬁnancial crisis. That is not the only reason I have chosen to stand for Parliament in the General Election this year. I stand for Parliament because I see an opportunity to educate voters that Labour–National is a single party. National has agreed with most of the laws that some true-blue Kiwis say they oppose Labour for passing. And in these elections, there are not too many alternatives if voters seek a balance to the technocratic ways of the major parties, but a balance is what we need. There are the Greens, and us at the Alliance. You read that correctly. Us. If you really want a change, which is what I hear New Zealanders say they want before I put forward my candidacy, then a vote for National will not deliver it. A vote for Labour certainly won’t, with an economic direction about as vague as Sylvester Stallone’s collective movie dialogue. In fact, a party with no ties to rich establishment ﬁgures, but a concern for everyday New Zealanders, gets my vote, in more ways than one. Remember, the Alliance invented Kiwibank—something that Labour, through its leader, the current Prime Minister, was initially opposed to. It sent a message to the foreign ﬁrms wanting to eat up Kiwis’ savings like vultures that they weren’t going to succeed. It effectively ﬂipped them the bird. Having a bank owned by New Zealanders prevents some of the exposure to the whims of foreign proﬁteers—and we’ve seen plenty of that happen from the Australian-owned banks. Bank fees, anyone? There’s no Jim Anderton—he left the party six years ago—and no potential MPs that have special interests to the Business Roundtable or international ﬁnanciers. Something downloaded or installed Arial on my computer today. Arial is one of those typeface families I never use. I think I used it once in 1992. That was the last time. I have never liked the look of it, although I am glad that Monotype resorted to creating an original design (or, rather, adapt a design it owned) when commissioned to creating a Helvetica substitute for Microsoft. Design-wise, it does not sit well with me, so I have never had it installed. Imagine my surprise when my Google Toolbar and numerous other pages (notably Google itself) began displaying in Arial today—even though it did not show as installed on my computer at all. It does lie dormant in one of the ‘Fonts’ folders, but considering that has never caused them to be installed without human intervention, I never thought they would do much harm. I don’t know how sites can install fonts (outside some of the font embedding tools)—then have them not show up in any menu as installed—but that seems to be what happened today. I have often said I can break most programs quite readily as the weirdest things happen to me—and this counts as one of them. I have had to go into the Windows XP font folder and remove all Arials out of there and now, everything speciﬁed for it displays either in Lucire (our house sans serif) or Helvetica. But its appearance remains a mystery. It wasn’t there earlier in the day, only on a restart. I also don’t want to say it, because it’s more likely my memory is not serving me correctly, but I could have sworn that I had deleted all Arial font ﬁles off this computer when it arrived, which has typically been my practice. The new Facebook design is getting a lot of negative feedback. Three groups dedicated to protesting the new look have grown hugely in the last few days, reaching 500,000 to 700,000 members each. The largest, Petition Against the New Facebook, was increasing its numbers by 7,000 per week at one point; it has grown by hundreds of thousands in the same period, to 671,000 at the time of writing. There are folks on both sides—some think such groups are useless and even pop by to tell the members how ineffective they will ultimately be. They also point out that even a million users mean 1 per cent of Facebook’s total user base, and mean nothing. Others feel Facebook should listen to them, even if it is a free service, because they are users and are helping the company make money. That entitles them to a say. As I observe these groups and Facebook’s behaviour since late July, when most users found out about the new design, I ﬁnd the company has been breaking quite a few rules in the PR playbook. Facebook’s comments so far have been along the lines of dismissing the anti-new-FB groups. The one per cent argument—Facebook calls it a vocal minority—is tempting, especially as it could stand to treble its advertising revenue with its new design, assuming the 99 per cent remain. However, I do not follow this: not everyone will join a Facebook group for their own reasons, and remember that Coca-Cola also bet on mass acceptance when its own research showed that few would object to New Coke in the 1980s. Facebook might have a bigger revolt on its hands than the numbers show. Similar groups that never reached anything close to a majority of Facebook users included one to rid the service of the ‘is’ in its status updates and another to rid the requirement of inviting 20 friends when adding applications. Both were successful. It would be prudent for Facebook to at least acknowledge that there is a grass-roots effort against the new look and listen to some concerns. I have seen nothing from the company that any responsible, sensible ﬁrm would have issued by now, knowing that a vocal minority could indeed ﬁnd footing. The rate of growth cannot be ignored because it is exponential. The company has not polled users on what they would like. One of its redesign team claims it has, but few would agree this ever took place. Of course Facebook has a right to make a buck and not listen to anyone. However, history shows this is a dangerous path. Two sites, which added similar complexity that some anti-new-Facebook people dislike come to mind, and neither of them had groups of 600,000-plus reminding them of their folly. Boo.com was an overly advanced website in the age of dial-up and considered an early example of a dot com ignoring its user base. It failed badly and no longer exists. Once the world’s leading search engine, AltaVista, created a portal when users just wanted a good search engine, also ignoring users. People say Google became widely successful because of PageRank, but that is not totally true: netizens, sick of search engines adding in features they did not then want, wanted someone to get back to basics with a large index. Google was it. As to me, I like the new look but I dislike the application incompatibilities and slower loading speed. My feedback in late July was acknowledged. However, I notice one user still reports similar bugs as of yesterday to what I complained about. When the new Facebook becomes permanent, will it be bug-free and efﬁcient, or will it give many people—many outside the 600,000-plus in each of the anti-redesign groups—an excuse to go elsewhere? Certainly few want to be on a site where it knows those behind the scenes have not listened or have proven arrogant in treating the public. Facebook has not learned from very recent history and it may ﬁnd some people head over to its Russian rival, Vkontakte, in the same way that AltaVista refugees went to an upstart Google. It has happened before. After hearing about Google Chrome on PBS today, I decided to give it a go. Ever since Netscape messed up Navigator 4·7’s successor, I had been looking for an alternative. I switched to IE5 around that time, and haven’t really switched back from the Microsoft engines. Maxthon—the browser developed by freedom-loving Chinese on the mainland—has been my browser of choice, because it loads the IE engine without all the extra add-ons, in the same way Firefox loads the Gecko engine. My main objection to Netscape, and Firefox, was that after 4·7, it has taken a retrograde step when it comes to Latin typography. Simple things such as quotation marks and ligatures can show up in a different typeface, depending on settings. Certainly on all three of the computers in this ofﬁce, ligatures do not show properly on Firefox and if you are typosensitive like me, then it’s not really an option to see a typeface change every few lines. Google Chrome loads up pretty much like Firefox, with the same linespacing and paragraph indents, when I go to either this blog or to Lucire. Feeding in this blog entry using Chrome, it shows the text in Courier, which Firefox does on this system. Both these things I can live with. And the good news: the ligatures work! Finally, someone invented a non-IE browser that can cope with ligatures and quotation marks, bringing us back to where Netscape was in 1999. Good on you, software bofﬁns: it only took you nine years. Speed-wise, it is slower than Maxthon, so that is the ﬁrst black mark against Chrome—why put up with a slower browser? The user interface is nice. I know I am using Chrome, so there is no point seeing the program name in large letters across the top. The minimalist layout is good and it’s Chrome’s strength. There is no reassuring noise when clicking on a link, as IE has, but it’s a small change I am willing to make. Because of Chrome’s simplicity, however, there is no way to set default fonts, so if I don’t want to see Courier, then that is too bad. It’s a second black mark as far as I am concerned. It also allows me to copy an image’s URL without my having to browse the image properties. Excellent: it’s the only browser I know of that has this simple option. The search function is quite good. Google has been clever enough to blend the search box and location bar into one—while others have done this before, even Firefox has maintained a separate search box to the side. Google Chrome’s designers have seen ﬁt to eliminate the separate search box altogether. However, every time I search, I am taken to google.co.nz. I never asked Chrome to default to the New Zealand version of its engine. Even when setting manually the search engine as google.com in its options, Chrome will not oblige. Even when I use the New Zealand version, go to the home page and click on ‘Go to google.com’ (the technique one normally uses to tell Google which search engine one prefers), future searches still go to google.co.nz. I have always believed it should be my choice to use over which version of Google I should use and other browsers respect this. Even Google itself respects this if I were surﬁng as a regular person to its site using any other browser; and its toolbar, too, respects whatever choice one makes. This is not a lack of patriotism but simple business: because most of my online publications’ readers are American, it is important for me to see what they might be seeing through Google. The only way to stop Chrome from redirecting me to its own choice of search engine, ironically, is to use a non-Google option, e.g. feeding in Yahoo! Search as the default. I had the same objection once upon a time to the Ford Motor Company, which forced users to the local site depending on where they were surﬁng from. So a New Zealand Mustang fan would be stuffed: ford.com would redirect to ford.co.nz, and you can read up on the latest Laser hatch. Ford, thankfully, abandoned this technique. So most of Chrome’s little problems I can live with, but the speed and absence of typographic control will prevent me from fully switching for now, though I would be prepared to use it every now and then. But the biggest problem with Chrome is the way it searches Google—and that seals the deal. How strange that the worst feature about a browser developed by a search engine company (or what used to be) is its search. In fact, it would steer one away from Google to another search engine; and in this respect its rivals are actually more supportive of Google! Therefore, I won’t be adopting Chrome as my browser of choice, at least not till it goes out of beta. PS. : The search bug disappears through closing Chrome and reopening it. But Chrome hasn’t won me over yet. Other issues discovered since I wrote the above include: no Autoﬁll as the Google Toolbar has; and Chrome’s spellcheck identifying errors in words with smart apostrophes (e.g. hasn’t in this sentence; it also thinks that spellcheck and google in this paragraph are misspelt—the latter is also ironic). It also fails to refresh the page, despite the Refresh button at the top of the browser. Even holding it down with the Control key makes no difference.